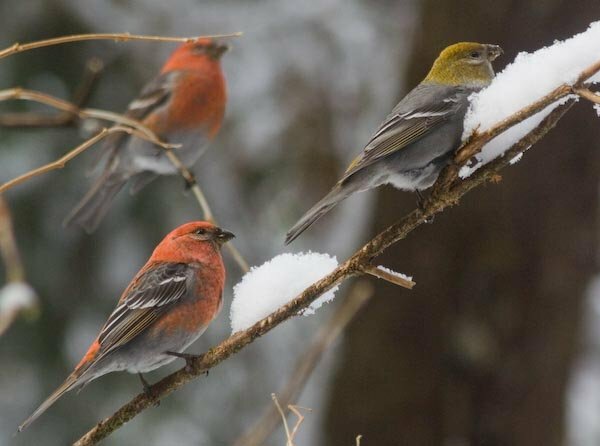 One of the highlights of yesterday’s outing was a small flock of Pine Grosbeaks we saw foraging near Indian River. The first look I got was in the forest near the river not too far up from the first bridge, but they were in the shade among the branches, so it was difficult to see any color. 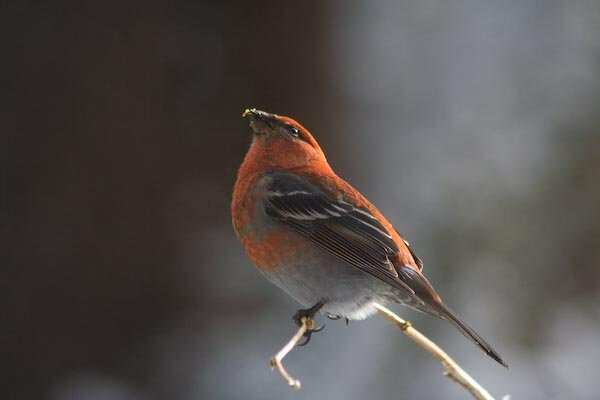 I thought they might be Pine Grosbeaks, but I was not sure. After travelling a little further on down the river, the birds showed up again. Or maybe it was more like a game of catch-up. There were at least three of them, but only one remained in view for very long. I slowly approached it, taking pictures as I went. It was a bright red male bird with it the sunlight shining on its back (see photo above). The bird was perched on a salmonberry branch extending up from a large rootwad of a tree that had fallen into the river. The bird was probably 10 feet above the water, but in the middle of the river. I expected the bird to at least give some indication that it noticed my approach, but it made no obvious sign that it did, even when I made more noise than I wanted getting down the bank to the river bed. I was able to walk pretty much right underneath it. It ignored me the whole way, keeping its attention directed up into the trees above me. In hopes of getting a better angle, I walked around the root wad, and found two more birds there, but a little lower down. The root wad had blocked them from my view, but they also seemed unconcerned with me. They both were looking up into the trees toward the same place as the first one. By now I was getting pretty curious about what might be drawing their attention. I wondered if it might be a predator, but it seemed odd that they would remain out in the open in that case. My questions were answered a few moments later when I saw two birds flying into the branches of a tree where the birds had been looking. As soon as these new birds flew in, the birds I had been watching all started calling out. It did not take but a moment or two more before the new arrivals flew out of the tree and joined the ones that had been waiting. At this point, most of them flew accross to the other side of the river and joined a couple of other birds that I had not noticed previously. In all, there were 8 birds. I think half or more were male, but I do not remember for sure. After the two new birds arrived, they all started actively feeding. Mostly they seemed to be going after the buds on the salmonberries. One bird stayed on the canes that were growing out of the root wad, so I got a pretty good look at what he was doing. 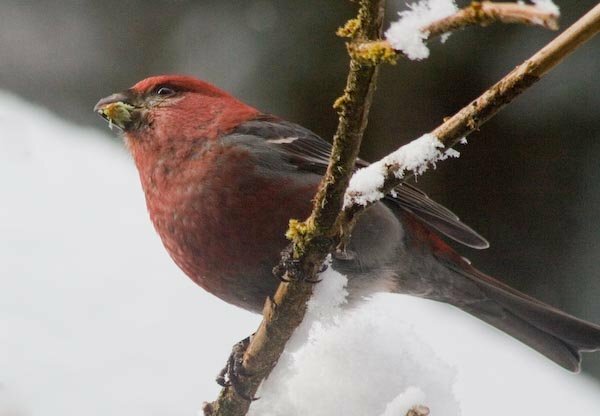 Given their choice of food, it seems unlikely that Pine Grosbeaks would have much trouble finding things to eat, even in a snowy winter. It’s hard to imagine having so much snow that all of the salmonberry bushes were buried. They also seemed to be willing to eat buds from other shrubs, though mostly they were on the salmonberries when I saw them. I found it interesting that they were all waiting with such quiet intensity for the late-comers to arrive. It seems like it must have been a family group, or perhaps just a bunch of unrelated friends. I’m not really sure quite what to make of it all, but it was fun to watch.